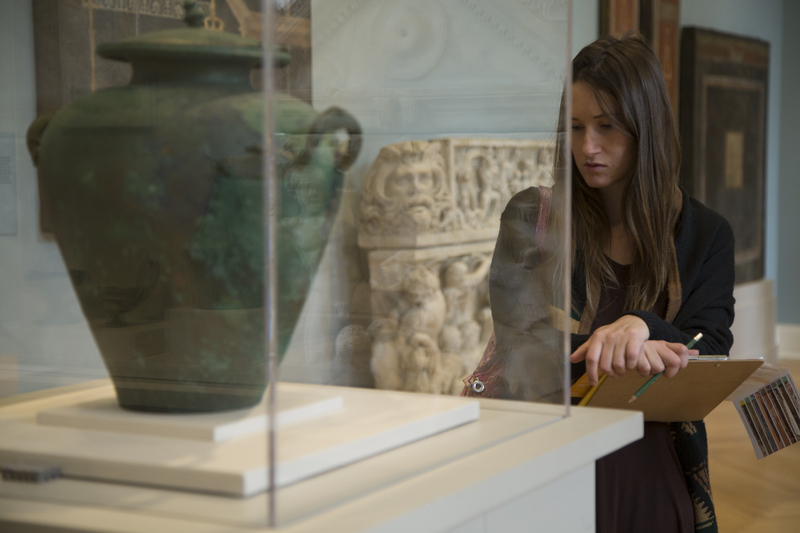 Through an interesting research project, a RISD alum and a current grad student invited first-time museum visitors to critically assess the RISD Museum. In November 41 people who rarely, if ever, visit art museums participated in two weekend sessions of Look at Art. 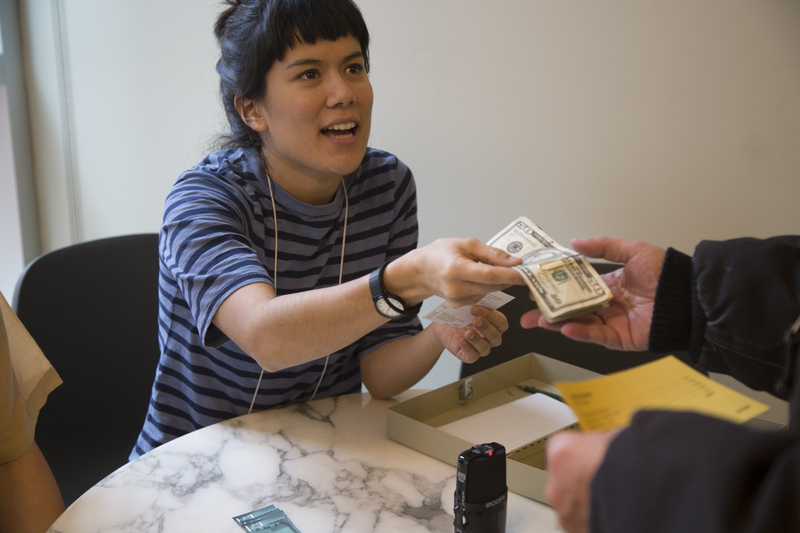 Get Paid., a study designed and led by Maia Chao MFA 17 GL and Josephine Devanbu BRDD 16 PT (with assistance from Bryn Pernot and Maria Paula Garcia Mosquera of Brown Public Humanities.) 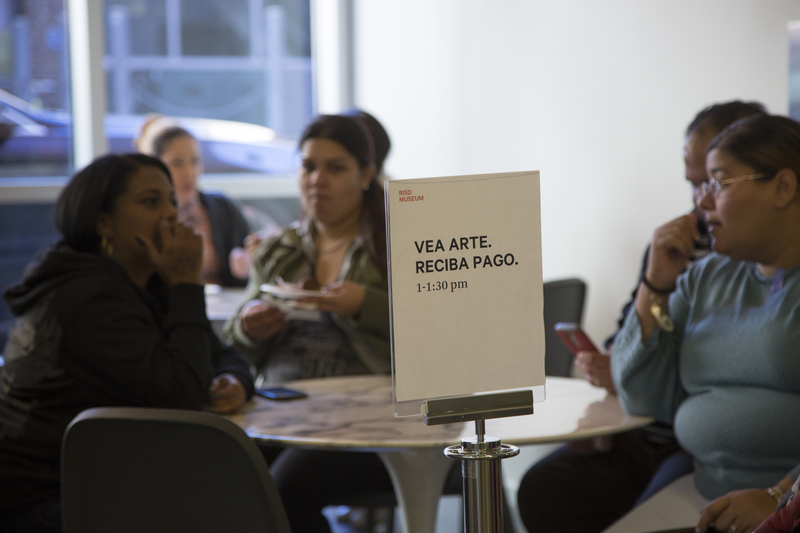 Mutually drawn to intersections of the arts and the social sciences, the researchers turned to people outside the RISD Museum’s customary circle of patrons and professionals to glean insights about its galleries. What does the museum say (or not say) about global history and cultures through its holdings? How might outside perspectives help the institution serve a broader audience? And how does getting paid to look at art affect how and what people see? Hoping to answer these and other questions, Chao and Devanbu advertised the study on Rhode Island Public Transit Authority (RIPTA) buses and then conducted 30-minute interviews with selected participants in preparation for the on-site sessions. Guest critics were paid for the totality of their participation in the study, up to, including and after the two-hour, self-guided tours of the museum in which they browsed its collections, critiqued individual works and considered the question of how the global and historical richness of art and design is represented in its galleries. Some pondered how Egyptian, Greek and Roman artifacts reflect the mythology of those cultures, while others drew connections between past and present stirred by Andy Warhol’s 1964 silkscreen, Race Riot. One observant critic examined the portraits inside Pendleton House, curious about what they say about gender and authority in 19th-century America. Chao and Devanbu bonded over their related coursework at Brown, where the former was a cultural anthropology major and the latter a Brown|RISD Dual Degree student. They began collaborating on Look at Art. Get Paid. more than a year ago, with support coming from the museum, RISD Research and the Fine Arts, Liberal Arts and Graduate Studies divisions. Getting the project up and running—from writing multiple research proposals to coordinating event logistics—provided the duo with “a window into the creativity of administrators” who help devise, support and implement worthwhile programs within complex institutional structures. To reinforce the “sense of humor and idealism that speaks to an art practice” and informed their project, Chao and Devanbu created a quick “job description” that asked each critic to review not just the individual artworks but also how they are displayed, who else is looking at the work and how all of these elements come together. For participant Derrick Jenkins, spaces like Pendleton House – the first museum wing of its kind for displaying American decorative arts—pull American history into the realm of the senses. “I can close my eyes,” he says, “and live back then, hear the sounds outside.” For Darrin Pettaway, another participant in the study, the museum’s collection of Egyptian artifacts deepened his fascination with that ancient civilization. A number of guest critics admitted that they wished they had seen their own cultures reflected more prominently by the museum—an issue that motivated the researchers’ project from its inception. Now, in the aftermath of the 2016 election, Chao feels a heightened sense of mission to translate the results of the duo’s research into action. All efforts to protect diversity and equity wherever possible “are even more relevant now,” she says. In an effort to share their research, Devanbu and Chao are producing a short video about the project and are considering writing a research paper for publication; they have also discussed importing the structure of this study to do research at various museums and other spaces that seek but don’t always find a broader audience. Otis Gray 14 SC brings much that he learned in the studio to producing Hungry, a podcast about the power of food in a polarized world. Artists-in-residence Raqs Media Collective present an experimental film at the Chace Center exploring notions of narrative and counter-narrative in their study of marginalized members of society.